Farnsworth D-15 Color Vision Test - Ophthalmic Equipment and instruments for the professional of today. The Farnsworth D-15 Color Vision Test is the newest version of two popular color deficiency tests. Comes complete with contemporary storage case in which the caps are housed. This design provides quick and easy method to remove and replace the caps, to save the professional time. When the patient replaces the caps, the box is closed and turned over to reveal a transparent plastic bottom, allowing the numbers on the bottom of the caps to be in clear view to facilitate quick and accurate scoring of the caps. This Farnsworth D-15 Color Vision Test is designed to correctly identify all (congenital and aquired) color deficiencies, no matter how slight. A score sheet is enclosed to represent the order of the patient’s arrangement of the caps, with respect to their correct sequence around the color circle. This allows the clinician to compare the axis of color confusion(s). The perfect companion product for the Farnsworth D-15 Color Vision Test is Gulden’s “C” Daylight Glasses which convert incandescent light into the correct Illuminant “C” for color testing. The long-standing, very-familiar, Farnsworth D-15 Dichotomous and Lanthony Desaturated 15 Hue each consists of a set of 16 different colored papers affixed on the top of numbered caps. Each cap has a 1.2 cm circular disk of colored paper. 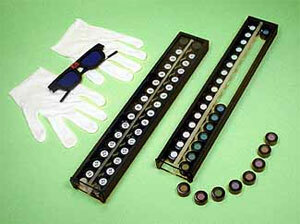 The Munsell color system is used. A reference cap for each set is marked. Also included are a pair of cotton gloves. If you need more information regarding the Farnsworth D-15 Color Vision Test please fill the form and specify the model in the Comments Field. Are you done with the Farnsworth D-15 Color Vision Test ? Go to Main Page.